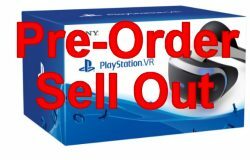 Two waves of PlayStation VR pre-orders have already come and gone with the initial stock allocation already a sell out. Anyone pre-ordering on Amazon.co.uk after 11.45am on the 16th March is not guaranteed a unit on launch day, just an email nearer the time for an estimated delivery date. The initial PlayStation VR stock on Amazon.co.uk sold out in literally minutes. It was a similar story at GAME.co.uk whereby they are currently selling their "Phase 2" allocation of stock. The only retailer currently still claiming launch stock is Tesco.com with their website at the time of writing stating "Order now for delivery on day of launch". All retailers are limiting pre-orders of the PlayStation VR to one per customer as stock shortages are looking inevitable after launch in October 2016.